The story of Mahabharata is nothing new to me. A kingdom greater than any - cousins fighting for the throne - sacrifices, promises, boons, curses - war - bereavement - atonement. An epic. The Mahabharata is an elaborate story, which can be perceived from any character's point-of-view and still have a rich storytelling experience. So, why not tell in from a woman's perspective? While I was growing up, Mahabharata was always about the virtues of the brave men who went to war. There wasn't one story about what it was to be a woman during those epic times. This book is the wonderful tale of the woman who was the cornerstone of Mahabharata. Told in first person, this tale takes us to the depth of Draupadi's soul and shows us her views as the events of the great epic unfurl. 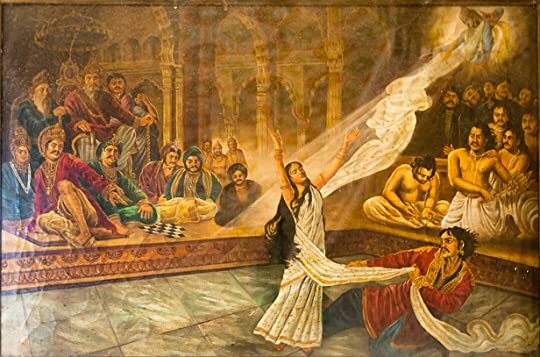 The best part about The Palace of Illusions was that, as a modern woman, I felt very connected to Draupadi. How Chitra ji manages to walk the fine line between the old and new interpretations of the character of a 'strong woman' is beyond me! The author mixes the right amount of fiction into the archaic tale without taking away its original flavor. I mean, I have never heard of Draupadi's love story in the original. (view spoiler)[ The new Draupati falls in love with Karna when she sees him at her Swayamvar. Her love for him is only intensified after her marriage and she yearns for him all her life. Here's why I think it might be true: a woman with high ambitions would see Karna as an achiever. She would find him capable and deserving of her love not only because he is wise, brave and handsome but also because he would respect her and treat her like the Queen she is. So, despite her fate, every time she sees him her heart gives a jolt. He was her one true love, until the end. 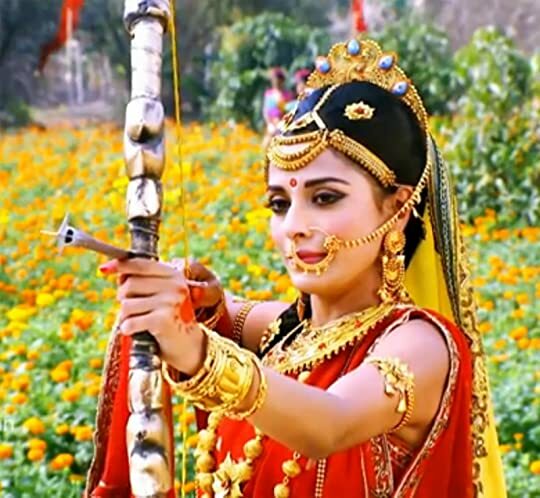 (hide spoiler)] Draupadi is a fire born princess with lofty goals for her life. Sadly, none of them come true when she married the Pandavas. It is only fair that she keep thinking of where things went wrong for her and wondering if she married the right guy(s). Draupadi's love story arc comes as a surprise because I have never imagined this possibility before! I just assumed that Draupadi accepted her life and marriage with satisfaction. The version that we have all been given has been avoiding a crucial detail about her character - Draupadi is a woman driven by resentment and regret of her own choices. How could she be happy in that miserable married life? Have we been painting Draupadi as a meek martyr when she clearly was much more? It was a new take on Panchaali and I think it fits her perfectly. Brilliant interpretation Chitra ji! It might or might not be true. I don't know if other interpretations tell the story the same way, but you have convinced me of your interpretation so beautifully, that now I begin to wonder if your version is the original version and if the truth somehow got diluted in the million re-tellings. Emotionally, we see the bitterness that shapes up Panchaali from the start. We see her angry, we see her withdraw, we see her contemplate, we see her lash out in blind fury, we see her curious, we see her loving. As the story progresses, the insight into Panchaali's inner doubts and fears become much our own. We see the princess who felt like a misfit at her own dad's place but eventually found a home in The Palace of Illusions. My heart goes out to her. Panchaali's story is that of a woman so blindly confident of her unique destiny that she brought about her own misfortunes. Her pride fell. And then, she grew, learnt humility, kindness, surrender and acceptance. She grew to find a woman's power in her. She grew to identify her devotion to Krishna, and her love for him which is beyond body and mind. I admit it. Usually when I think of Draupati, I only think of her shame and her terrible fate at the hands of Dushasha. I was so wrong. I hadn't given her much credit. 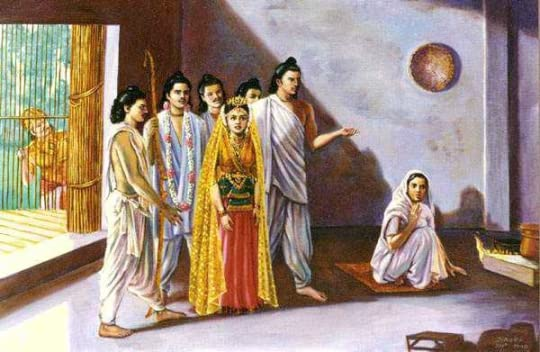 Understanding Draupadi's background and her character was a privilege. It was amazing. I understood the bottled-up rage and fury against her husbands, the shame that befell the pride of the Queen of the Pandavas and the surrender that sparked from desperation and her love and devotion to Krishna. It was amazing to fill in the emotional blanks that I had of Mahabharata when it comes to Draupati. Throughout the story we see other women of her age - Sudheshana, Banumati, Subadra, Uttara. None of them even compare to her. None of them even come close to The Fire Princess! Not even Kunti, who after a point accepts that it isn't her place to rule over what the Panchali says. And that is the most inspiring part of Panchaali's story for me. Chitra ji's art of storytelling comes out in the most unlikely places. Her idea to interpret Mahabharata from a new perspective is seen even in short snippets. For instance, we all know the part where Arjun and Duryodhan ask Krishna to join them in the war. In this story, this incident is told from Duryodhan's point of view, meaning we are privy to his arrogance and utter confidence in his victory, in contrast to the third-person, moralistic tale we have been hearing so far. While telling a tale of this magnificent scale it's impossible to avoid villains. Sometimes, flawed characters need to remain flawed. Chitra ji's story had the compulsive need to seek goodness in flawed characters, and that felt far-fetched. It is okay for the characters to have chinks in their armors. I felt that the reasons the author gives to justify them were mere excuses. I just feel that when writing POV, it's okay not to idolize everyone. 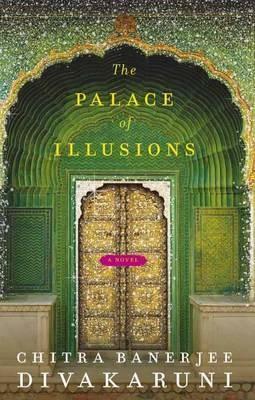 Sign into Goodreads to see if any of your friends have read The Palace Of Illusions. 5.21% ""a story gains power with retelling""
11.46% "What a powerful prophecy! And how terrible the fate !" 23.44% "Karna :'( Yours was a terrible tale...."
36.46% "What would have happened if you had married him, Draupati? The Son of The Sun?" 39.06% "It's incredible to see the equation between Kunti and Panchaali - the original Saas Bahu." 49.74% "Oh no no! I don't want to read this part." 62.76% "A love story, Untold. This is beautiful!" That is one hell of a review. Brilliant and amazing. However, I would like to tell you a little something. The part about Draupadi and Karna's love story, it is actually a pretty famous alternate version. Many books have used it as well. And I think, for it has been too long, that Draupadi's character was never a weak or meek one. Not even in the telly series. I was unaware of the Karna love arc, so it came as a big surprise to me. Draupadi's character was fiery, yes. But it feels good to have an explanation for it, you know. Some background. Her past, and her ambition from a young age. I do hope you read it and enjoy it. Yes, i know what you mean. It's like seeing something from a fresh perspective that brings to light some hidden aspects, right? Yes, I will definitely try to read it sometime this year. Oh, have you read Ajaya & Rise of Kali by Anand Neelakantan? It's another retelling of Mahabharata from Duryodhana's POV. That is right. It's good to have a fresh perspective on Mahabharata. I feel that this epic is so elaborate, we can tell the story from every character's perspective and it will still have its immense richness. I agree. It's a very huge epic tale. I love it all the more everytime i read it of hear it. I've read (and given up on) Anand Neelakantan's Asura - Ramayan from Ravana's POV. Now, he's written about Duryodhana. Maybe the author's got something for the villains of history. I started reading Asura too, it was just a waste of paper I believe and I too gave up on it. But the Ajaya duology is better than that. The things is, it starts off very nice. How Duryodhana feels threatened by Pandavas and how he believes his right to the throne might be passed to them. How he is an impulsive young boy, politically incorrect and stuff. But then gradually, the author spins it into something that is not the mahabharata. I hear the re-telling of ramayana by Ashok K. Banker is pretty good. But it is a looong (8 part) series. To be honest, I'm tired of all the Ramayana re-tellings. I mean there is only so much story there for one to tell. But Mahabharata, wow. A million stories in one story. That's what I'm currently interested in. To be honest, I'm tired of all the Ramayana re-tellings. I mean there is only so much story there for one to tell." I know exactly what you mean. Also, i've found, connecting to Ramayana is not easy. With all the perfect and dutiful characters. It lacks the human touch. But Mahabharata on the other end, each line has the reflection of what it is to be human. There are numerous lessons to be learnt. I think this the reason it is much more enticing. Don't you find? Great review! This book is on my to-read for a long time. Hopefully, I will finish it this year.